Black/white one-piece: The exact swimsuit I got from Anthropologie is no longer available, but they have tons of beautiful one-pieces that are really well made. Mine has the boyleg bottom which I think gives it a fun, retro feel. Two-piece bikini: Both pieces are from Victoria’s Secret “bikini mixer” collection. High-waisted two-piece: I found this suit on Amazon and they have a number of different styles, however, you can find this exact swimsuit at a number of places online. Searching for “high-waisted swim suit” brings up a bunch of options. High-waisted polka dots: I actually just found this one recently at Zappos! It’s a really good quality and has ruching in the front to help cover everything up. It’s just the bottom sold there. The top is the same as the two-piece bikini top from VS. Thanks, Louise. I’m glad it was helpful! I’ve found some GREAT swimsuit bottoms (almost shorts) in Black from Swimwear 365. They come up to the waistline, so the bag is completely covered. They do TANKINI tops that are a bit longer, and these tops have LAYERS and are available in several pretty patterns. When I wear the bottoms and the “layered” TANKINI tops, you can’t see A THING! I feel SO confident wearing these sets, I can fully relax and enjoy my holiday. I am in the U.K. by the way. Also, Swimsuits with a fully gathered front tummy panel look great too, as the “rouching” of the front disguises where the bag is!! Hope this helps anyone. Further to my last comment on “suitable swimwear for lady ostomists”, it appears Swimwear 365 don’t have the LAYERED Tankini tops they used to have. HOWEVER, I’ve bought THREE superb layered Tankini tops from M&Co in the U.K. Not sure if they ship worldwide. I’ve also bought their black bikini bottoms, which do fit right upmON the waist, to wear underneath the Tankini tops. These bottoms are incredibly comfortable. ALSO, take a look at the layered Tankini top that MIRACLESUIT do – I’ve got it in black and it’s fabulous. I am 1,000 confident when wearing these items. No sign WHATSOEVER that you are wearing an appliance, so you can relax completely and enjoy your time. For the bottoms, Search for….HIGH WAISTED TUMMY CONTROL. The items are true to size. I’m a 14, ordered the 14 – simply perfect fit. Hope this helps some ladies in their search for THE perfect swimwear for us Ostomy gals!! I appreciate that, Christina. Thanks a bunch! If you buy the one piece larger, what about bikini top underneath in a matching/contrasting colour? THank you, thank you, thank you for this post! 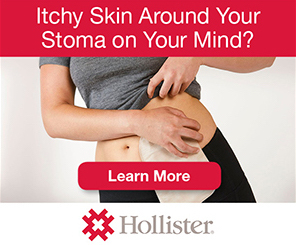 Now that I am preparing for another summer wtih a temporary ostomy, it is good to know all the options. I typically wear a normal bikini with a mini-bag, and let it all hang out. I will throw on a wrap or cover-up if I’m venturing away from my core group at the beach, or sometimes a tankini top if I’m getting in the water (to ease my irrational fear that my bag is going to be taken by a wave!). I would welcome anybody that wanted to approach and ask questions about my ostomy and the story behind it. I’m so appreciative of you sharing these other swimsuit choices, in case I wanted to try something a little different. Question: Have you had any issues with leaks with the bag held that closely to your body? I’ve had a couple of instances in the past when something snug-fitting kept the bag from filling properly, and so everything collected around the wafter, causing a leak. I’m so glad it was helpful to you, Amanda. I haven’t personally given the tankini a try, but that’s another good option! And I have not had any issues with leaks from the bag being held too close. As I mention in the video, the Spanx suit is very tight across the middle, but even then, when it has filled up it hasn’t caused any leaks. Was there perhaps something restricting a particular part of the bag? With these suits, I feel the “restriction” is pretty well distributed, so it doesn’t block up near the top of the bag. In my opinion,it is best to “cover” the Ostomy bag. I’ve asked many people over the years, if they would mind seeing someone with a bag on show on the beach or by the pool. A staggering 98 per cent said NO and that THEY themselves would be embarrassed and not know where to look if they saw one “on display”. BETTER DRAPED!! Victoria Beckham won’t wear a bikini because of her ceasarian tummy scar. She wears FABULOUS swimsuits. I had so much anxiety about this upcoming summer since this will be the 1st one since my surgery. Having the right swimsuit helped ease some of those fears. Great video! Thanks for the video! Do you wear a waterproof cover over your pouch? Also how is maternity belt working out? Hey Dawn, I actually have never tried to waterproof cover. Honestly, I just haven’t felt that I needed one and I’ve done a lot of swimming with my pouch. But if you decide to try one out, I’d be interested to hear what you think. And the maternity belt is still my favorite ostomy accessory! Hi Stephanie! I went to the local target (Canada) and purchased a very cheap maternity belt! $16.99cnd. I love it. I bought one in white but when they have more stock will def. be getting black and beige. I also bought a cute sports bar as I booked my first 5k in September. So excited. Thanks for your suggestion on the maternity belt. I thought I was feeling pretty secure before but this just helps so much more! Especially in dresses and even rompers/jumpers. The brand I bought was Be Maternity-Beband! Summer doesn’t seem so scary now! Thanks for doing this! I love to find out about options for us. I wear a tankini where the top comes down to the waist, then the bottom takes it from there. The bottom is supportive enough to keep my bag in place, and comes up to the waist to cover the entire bag. My husband looked at me the first time & asked what I did with it! Couldn’t see it at all. I got it at Target a few years ago. But now I’m looking for another one so your ideas are great! Thank you for this helpful video!! This is my first summer with my ostomy and my boyfriend and I are planning a beach trip. Of course I want to still want look cute and your video helped a lot. I have just ordered a high waisted bikini and I am so excited about the suit. Thanks again for your post I am actually getting excited about my beach trip now!! That’s so wonderful! I hope you like yours, too. I mentioned that I tried it out for the first time over the weekend and I was really happy with it. Have fun at the beach! I wear board shorts and a bikini top,. I have to look for the longer leg version as my bag will hang out of the bottom of the shorter ones. But like your options too. Thank you for the great video Stephanie! Just found you! Wonderful video. You rock. You look adorable in those suits. Does anyone know know wher I can buy men’s swimwear with outer pockets to keep wallet/keys etc in? I have a bad peristome hernia around my Stoma so it’s hard to hide. I just purchased a swim dress I think it will cover well but there won’t be any support on flange. I haven’t swam since I had my Stoma it’s been 6 years. How reliable are the flanges to stay on while getting wet? You are a stunner and look fabulous in all of those swimsuits. Thanks for sharing the options out there. Your confidence is contagious. Armand, I will definitely work on compiling some options, but in the meantime, you should check out my friend Eric’s site at veganostomy.ca. He’s got great tips for men! Great ideas. I have a temporary illiostomy and have purchased a few separate high waist bottoms with cute side details and pair them with my selection of bikini tops. These are so great! I’ve also had success with Vanilla Blush suits and the Regina suit from Jessica Rey! Hello ladies! I am a wound and ostmy nurse. I have a very young patient, 16, she’s not youngest ever. She and her mother are asking for suggestions that might allow her to hop swimming, go to the beach, feel attractive and more normal. I’d love some suggestions for websites and material to pass on! My colostomy is transverse so anything suitable please?